Lunchtime Links: Using up potato water and cabbge (2 separate things),making rice cool,and more. Ohhh,man…. Chilli Cheese Tater Tots. I probably would use beans instead of the beef. Use it Up: Potato Water – How to recycle the water you boiled taters in…use it for other food or water your plants with it. 28 Recipes to Celebrate Spring – Spring! I am so excited. The best thing about cooking w/ seasonal ingredients is that they are often less expensive when in season. Next Next post: Revisiting the affordability of “Grow your own food!” …. I KNOW! On Yahoo one day, they had “budget” meals that were like $4. Um…no. TELL HIM I DIDN’T MEAN IT! bahaha. I picked some of the most a-hole things I possibly could.. one of my friends didn’t know I was joking until the third one in, he almost thought we couldn’t be friends anymore! ha! Cool ideas. 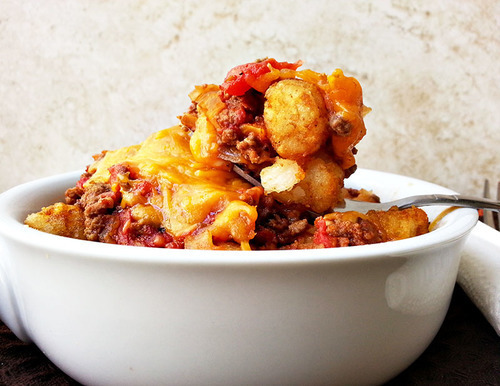 The chili cheese tater tots are on my to make list next time my hubby falls of his diet. But I can tell you do NOT water your plants with any cooking water you’ve added salt to. Ask me how I know. Also, I owe my 9 year old 6 strawberry plants. Ha! Oh,yeah…that’s a good point. If you are into making bread, your potato water is good to use rather than water or in place of perhaps half the milk. But you may need to cut back on the salt in the recipe.